You are here: Home / Featurettes / Weekly Roundup: Want a Better Memory? 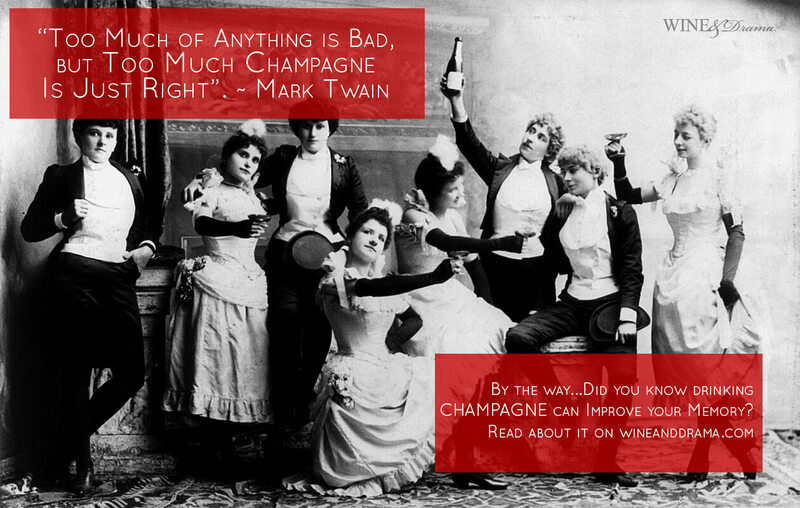 Try Drinking More Champagne…No Really! If you’re visiting us on #WineWednesday at Wine & Drama HQ, welcome…it’s always wine day here. Today, I’ve got some great news that’s going to make you pop Champagne on the regular…Are you ready for this? ARE. YOU. READY? I feel like Oprah! I’m so excited I can’t stand it! Did you know…The benefits of Champagne may help prevent Alzheimer’s disease, protect your gray matter, and even boost your memory? I know right now you’re probably saying, “Alexandra, are you just trying to get me to day drink more often than I already do?” Well, sweetie…what’s the harm in one more little glass? But seriously all joking aside…this is science people. REAL science. Let’s go across the pond to our lovable nerds at the University of Reading in the United Kingdom, in a study led by Professor Jeremy Spencer it was revealed that champagne could improve your memory. Turns out the bubbly can also help delay the onset of dementia and other neurodegenerative disorders. How much champagne should you drink? Well that’s the fun part…by drinking one to three glasses of champagne a week, you may lessen and counter the memory loss associated with ageing. So, take that Aunt Tilda! I don’t know why you’re always giving me the stink-eye when I’m drinking. I’ve got scientific proof that when I’m 90, I will know where my car keys are and which one of my dogs are still alive. I won’t mistake Mr. Darcy for Coco. It turns out that the phenolic compounds (part of the chemical class tannins that composes the antioxidant components in grapes) found in champagne can improve spatial memory. No more getting lost on the way to your favorite restaurant that you visit just once a year. Who needs GPS? Not, you Ms. Google Maps. These compounds work by moderating signals from the hippocampus and cortex, which control memory and learning. The phenolic compounds also favorably changed various proteins linked to effective brain memory storage. You see these proteins get exhausted as we get older, making our memory storage less efficient, and result in us becoming more forgetful…which can lead to dementia. Champagne slows down these losses that happen as a part of normal and atypical brain aging. This is fantastic news for all of us Champagne lovers out there…but you white wine die-hards don’t just think you can get the same benefits from sipping on your Chardonnay. Where Do the Benefits of Champagne Come From? The benefits of drinking champagne for a better memory come from two red grapes used to make Champagne – Pinot Noir and Pinot Meunier, along with the Chardonnay grape. It’s the combination of these grapes that are responsible for champagne’s benefits. Previous research from the University of Reading also discovered that two glass of champagne can reduce the risk of heart disease, strokes, and improve blood circulation. All excellent reasons to drink more champagne. Why didn’t I study at this university? I’m going to start the campaign, “Drink more Champagne!” Tell ALL your friends. Since Champagne is the protected name for Sparkling wine only made in the Champagne region of France and thanks to its popularity, you can expect to pay a minimum of $35 a bottle. Sparkling wine, Cava (made in Spain), Prosecco (made in Italy) are usually about half the cost or even less. Ok, so do I have to say this? Doris, I’m talking to you…we all know drinking a whole bottle of Champagne isn’t a good idea right? Right, Doris? 2) Bollinger Brut Special Cuvee (non-vintage) around $75 a bottle – When I first tried Bollinger it was at a client’s home. The taste was divine…from the perfectly fine bubbles to the lush apple and pear fruit followed by creamy spice and slightly toasted walnuts. If you bring this bottle out…you really like the people you’re having dinner with. 3) Veuve Clicquot Brut Yellow Label (non-vintage) around $40 a bottle – “Veuve” means widow in French. That’s right the label really means Widow Clicquot. The grand dame Widow Clicquot took over her husband’s wine business when he died at 27. Which was unheard of back in the late 1800’s. She’s also the reason why champagne is clear instead of cloudy as it once was. Veuve Clicquot non-vintage is superb and has creamy, green apple, lemon, and nutty notes. Very bright on the tongue with all its fine bubbles. Madame Clicquot thank you for making many brunches and fancy dinners a wonderful delight. Bonus: Veuve Clicquot was even featured on Downton Abbey season six, episode one when Anna and Bates are finally exonerated from the murder of the horrible valet, Green. Spoilers, sweetie. And if you haven’t finished the final season of Downton…what exactly are you doing with your time? 4) Perrier-Jouet Grand Brut (non-vintage) around $50 a bottle – One of the more lively champagnes. You’ll get smacked around in a good way with this bottle. It’s lemony, some pineapple, a bit chalky, slight buttery biscuit notes, and full of mad bubbles – quick on the finish. 5) Taittinger Brut Prestige Rosé (non-vintage) around $68 a bottle – Oh, Taitty did you think Mummy would forget you? Tsk, come now. This is a gorgeous looking and just plain beautiful tasting champagne. Taittinger is the gold standard of all Champagne’s that use a higher percentage of Chardonnay grapes (it’s 70% Pinot noir and 30% Chardonnay) versus other Champagne Houses. It’s their signature style. A tiny portion of the Pinot Noir is made into red wine and then added to the champagne to give it its pretty color. It’s old school. It’s fruity, floral, and I love its rosy pale pink hue. Full of raspberry, candied orange peel, rose, cherries, and cream. It’s firm in structure and elegant. Taittinger Brut Prestige Rosé great choice for a special ladies tea or just drinking with your bestie. I recommend a glass or four a week to enjoy the benefits of champagne. After all it can improve your memory, keep you from forgetting where your keys are, and the name of that nice man down the street. Cheers!